In my last post I gave an overview of the Lazio squad and which players I would like to retain, dispose of and keep for the medium term. Rebuilding this great club would take time, patience and no small amount of financing. Their last Serie A win was in the 1999-2000 season under Sven-Goran Eriksson, although they won the Coppa Italia in 2012-13 under the guidance of Vladimir Petkovic, beating fierce city rivals Roma 1-0 in the final. Mustafi: This was one player that I was not desperately looking to sell, and I did receive a fee slightly under his valuation. However I felt that around £20m for a 31 year-old was too good to refuse. I have a strong preference to avoid buying anyone around this age, and I had earmarked a few replacements so I was keen to do business. His wages of around £110k p/w were also a consideration in his sale. His sale would go towards achieving my main objective for this transfer window. Lukaku: Jordan Lukaku is a talented defender although he does lack some core defensive skills such as tackling and positioning. He was only 28 and earning £80k p/w, yet I felt that I could upgrade to a younger replacement with better defensive attributes. His replacement was signed on wages £60k p/w cheaper and again, felt this offer was too good to refuse. Marusic: This was another deal that I wasn’t desperate to make; however aged 30 and with a £14m offer on the table from Juventus and another huge saving in wages, felt it was too good to refuse. Furthermore, I think it would have been harsh to have denied him the opportunity to play in the Champions League at this point in his career. Asenjo: This was a far easier deal to make and one that I’d wanted to make since joining the club; I am not a fan of players aged 34 and when an £8m bid came in I simply had to accept it. One of my main objectives was to sign a long-term keeper and this sale helped to achieve this perfectly. Carrea and Rosario: These players were nearing the end of their current deals and I didn’t feel that they merited another one, even though they could contribute for one more season. Therefore I took around £9m for the pair, whilst I felt that I had younger replacements already at the club who could take their place. Martinez: From joining the club, I had wanted to sell Martinez at any price, as he was aged 34 and earning £110k p/w, the highest earner behind Batshuyai. The fee was £3.4m, although I am contributing £38k p/w to his wages for until the end of June, which I absolutely loathe but had no option to do. The remaining sales raised little income, but the players weren’t part of my plans so I was happy to move them on. These four players could develop into talented players and I felt that they would benefit mostly from first-team football. They could also form part of the squad next season if they progressed whilst out on loan. I also made the Board agree to improve our youth recruitment, which is now classified as “extensive”. Alongside our superb youth facilities and dramatically improved youth coaching, I felt that the building blocks were now in place to generate a sustained production line of young talent. Audero: I believe that I have found a superb long-term goalkeeping option in Audero. Excellent goalkeeping, mental and physical attributes across the board, at £12.5m I thought he was a significant upgrade on Asenjo, for whom I recouped £8m. I hope that he will have a long career with us and I was very happy to get this deal over the line. Maina: Linton Maina was signed to add depth to the squad in the midfield area, and would play second fiddle to Tiago Dias. He has good physical stats whilst his mental capacities are also acceptable. At £2.5m I felt he offered reasonable value and would contribute to the team effort throughout the season. Kvida: On the face of it, an excellent signing for just £3.3m once I met his minimum fee release clause. With Mustafi leaving, I needed cover in central defence, whilst sticking loyal to my aims of reducing the squad’s average age. He is two-footed, has excellent defensive skills, and his mental skills are very good too. He has work to do to improve his heading and tackling, but feel that he has a superb skillset overall to work with. Centelles: The replacement for Jordan Lukaku on a quarter of the wages, Centelles was signed after I put extensive research into his replacement. I liked his speed and technical abilities, whilst he has a very good engine. I felt he offered excellent value at £4.7m. I am looking to improve the options available to me tactically, so being able to play both full and wing-back roles would give me that tactical flexibility. Senesi: In many ways I thought this was my best signing of the summer, for £7.5m. His value has now trebled, and although earning high wages, I felt that this was merited as he hopefully would become the defensive lynchpin of the side. With Mustafi leaving, an experienced head was certainly required; his defensive skills are excellent and he has a very good turn of pace, reinforced by superb mental strength. Kalala: We have Tim Jedjav at right-back, but with the departure of Marusic, I felt that this was a good signing to make, to further reduce the average age of the side and also to add defensive reinforcement. He possesses good pace and mental skills, and is also able to deputise in midfield. Once again, he would provide us with options and the much sought-after tactical flexibility. Simon: Attila Simon was signed on loan from Lyon, and he would give us further options in either midfield or attacking midfield. He has superb pace and crossing ability, and felt he could become a good option for us, particularly late in games. Ilic: With the departure of last year’s loan signing Pereira in defensive midfield, alongside the sale of Rosario, Ilic was brought in to be the side primary defensive midfielder from Manchester City. He has excellent technical skills, supported by satisfactory mental and physical ability. Willock: Chris Willock was brought in to provide further cover in midfield but on the left. Once again I was looking for more pace in the side, and as I couldn’t find a permanent signing that I wanted to make, I felt that Willock was a good option for us. I highlighted in my last post that we have a superb talent in Tiziano Fratena, and we have agreed a deal for him to stay for another five years. Given that we lack options in central midfield, he would give us cover in this area too. His incredible physical attributes are reinforced with superb technical and mental skills. He is going to be a very big player for us and aged just 20, will hopefully remain with us for many years to come. With recruitment now completed, time to assess the squad and plan our tactics for the season. As a reminder, when recruiting players, I always look for a balance of physical, mental and technical attributes. Our recruitment was good and with a solid foundation, I am intending to be more experimental this season because of the wide range of options open to me. The 4-1-4-1 DM is a system designed for the counter attack, and will be used against superior opposition. Given that I now had an improved squad with more options, this does not have to be an ultra-defensive or negative system. Over the summer we had acquired players with pace in wide areas, and they would be a key part of this system. However with a defensive midfielder sitting between two banks of four, the aim of this tactic remains to defend deep and break quickly where possible. Team instructions are key for this tactic, and relate to breaking quickly in numbers to support the lone striker, regaining shape after losing the ball (rather than counter-pressing) and running at the defence. This is a tactic that has served me well over the years, but for the next two I am introducing a new one and also a familiar system. 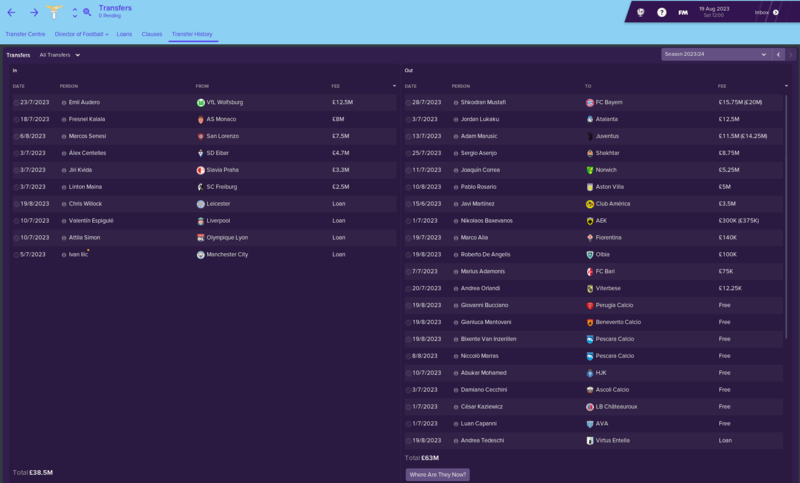 With three excellent centre backs at the club, I wanted to deviate from my usual tactics and for the first time in Football Manager develop a new system that also employs wing-backs. The principle here is to either use this one or the 4-2-3-1 against weaker opposition. Senesi is a BPD, a role that fits well into the system. The thinking here is to use him to move the ball through the centre of the field, and use the movement of the front three to create problems for opposition defences. Our two wing-backs will provide the natural width, so in attack I am hopeful that we will have around seven players to overload defences. I am interested to see how the Trequartista works with the Roaming Playmaker, so in early games I will keep a close eye on these roles. By employing Luis Alberto in the Trequartista role, I am hopeful that his movement will be at the detriment to Fratena’s options. The front two will operate in tandem, with Druissi coming deep and Batshuyai remaining furthest forward. I am looking forward to deploying this tactic but it could give us problems if employed against a side that aggressively presses. I am hopeful that it will evolve into something very powerful, but there may well be teething problems. The 4-2-3-1 is a commonly used Football Manager tactic which works well with the make-up of this squad. With two superb attacking midfield options in Alberto and Fratena, excellent wide attacking midfield players, it made sense to deploy this tactic once again. The personnel employed may well change throughout the season depending on form and availability, but I have enough flexibility in the squad to give me options. I intend to use it against weaker opposition, alongside the 5-2-1-2 system outlined above. The plan here is to dominate possession, play with a high tempo, use the movement and pace of the front four to create opening. By its nature it is a very attacking formation, so the two central midfielders will have a vital role to play in keeping things tight. The full-backs will not be needed so much in an attacking sense, given the already aggressive position of the AMR/AML. This is a new tactic for the squad, so the roles and instructions will evolve as we progress through the season. The Board set the target of a top-half finish, which I certainly felt was achievable. We now had the nucleus of a good squad with a far lower wage bill, and we were in a position to make further signings in the January window if required. I felt that the Coppa Italia would offer my best chance of silverware, with Serie A hopefully becoming a legitimate aim in the next couple of seasons. I am looking forward to the first derby of the season against Roma on Boxing Day. I think that a very exciting season awaits us! Follow Dictate The Game on Twitter and Facebook.